The holiday shopping season is in full swing for moms. Whether they are Millennial Moms or Gen Xers, mothers control purchases for the whole family, from her spouse’s office to child’s classroom gift exchange to her own purchases for the home. She’s buying seasonal foods, home décor, and entertainment products in addition to all the toys on her list. With so many brands fighting for Mom’s attention this season, it’s more important than ever for marketers to hyper-focus their tactics to drive sales. Here are six marketing to moms tactics that brands should be considering to emerge from the marketing clutter and connect with Mom in a way that wins her spending power. When a mom doesn’t know what to buy, she turns to online gift guides. They are an easy way to find the must have gifts, and the more a mom sees your product on the “must have” lists, the more she believes she has to buy it. This is one of the most affordable ways to work with social media mom influencers and bloggers and proves successful every year. It’s astonishing how few brands focus on Pinterest. According to research for “Millennial Moms: 202 Facts Marketers need to know to sell product and drive sales”, moms indicate that they discover brands on Facebook but purchase products on Pinterest. This is a platform not just for food products; moms search Pinterest for creative ideas and solutions, and your product should be there to inspire her. Facebook’s algorithm rewards video. Use fast-form videos to show moms in 3 minutes or less how to wrap your product or how much kids enjoy your product. These are simple to execute by activating mom vloggers to produce the videos on your brand’s behalf. You’ve been waiting to see Instagram on this list! However, it’s not enough to have a few influencers post typical photos to the platform. 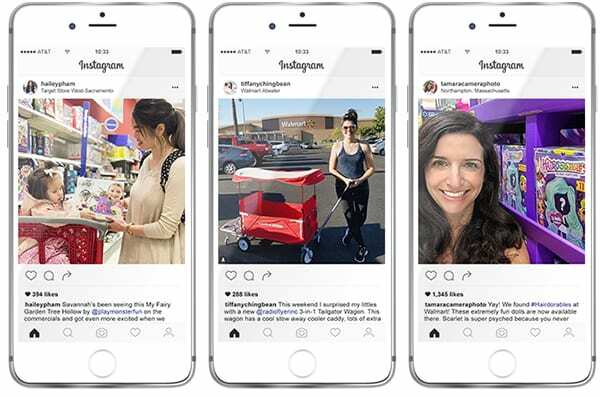 Social Spotters bring retail awareness to the platform by posting photos with your product in-store. Having mom influencers post from the aisles of Target or Walmart not only promotes your product, but also illustrates to mom followers where to buy it. Focus your marketing to niche mom groups and Gen Z tribes like scouts and athletic teams. Creating peer recommendations by sampling products in niche groups or engaging leaders as ambassadors creates authentic engagement and desire for your product or brand. It’s not all about Millennial Moms; Boomers and Gen Xers may be grandparents, but they are still buying toys, home décor, and seasonal foods. Not only do they purchase for their own households, but they also influence their Millennial children and purchase toys for their Gen Z grandchildren. Sometimes the best marketing to mom tactics are also the most affordable because they leverage common behaviors of mothers and serve solutions to common challenges. The holiday shopping season is the perfect time to discover new ways to make your brand relevant to mothers. 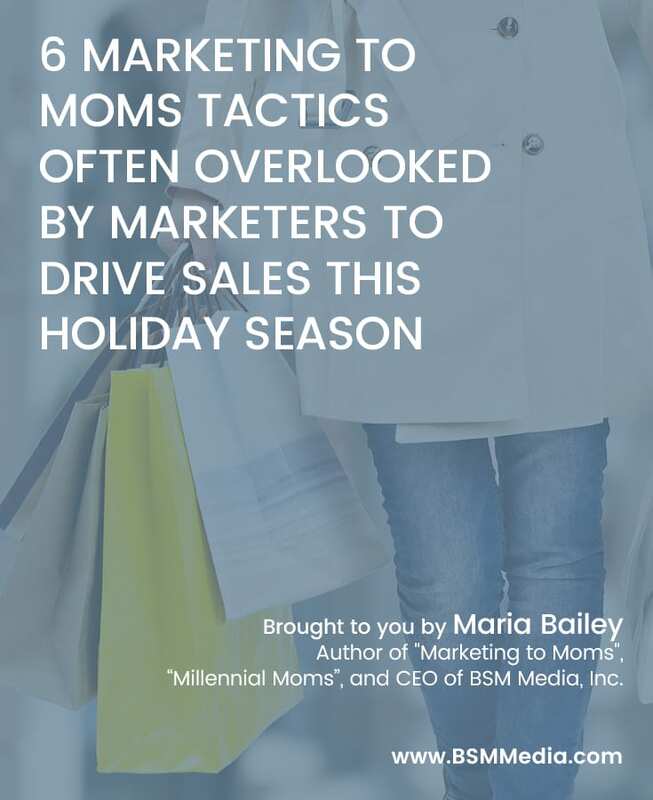 Contact BSM Media today to explore marketing to moms tactics to boost holiday sales in 2018 and stay ahead of trends going into 2019.